As a major military unit and vital component to the area’s economy, the Springfield-Beckley Municipal Airport provides air travel and cargo needs for both citizen and business activities. The Springfield-Beckley Municipal Airport is located on County Route 794 (West Blee Road), 4 miles south of the City of Springfield. To learn more about the Airport click here. The City Manager’s Office provides the leadership, management, and coordination for the affairs of the City with a professional City Manager and other staff as appropriate. The office carries out the goals and objectives of the City Commission with available resources, and also provides community liaison services, legislative support, Economic Development, project supervision and budget overview, policy development, and information about City service to the public and media. The mission of the City Clerk’s Office is to maintain the City’s records in a fashion which complies with the City Charter, making them readily accessible and accurate for the community and other City departments. The City Clerk also serves the City Commission’s public relations needs. The Community Development Department administers and coordinates the activities for the following Divisions: Building Regulations, Code Enforcement, Development Programs, Housing, Human Relations, and Planning and Zoning. The City of Springfield Department of Economic Development, working with the City Commission, has authority to utilize various state and local incentives in an attempt to create jobs, retain current industries, and recruit companies to Springfield. The Economic Development Department is located in the City Manager’s Office to ensure continuous communication between the City Administration and the City Commission on important economic issues facing the City. The Economic Development Office is responsible for several development related functions including business recruitment and development. The office oversees the administration of City financing programs, incentive programs, new business attraction, general project / client management, marketing of the City’s business parks and airport, business retention and expansion efforts, annexation, utility extension requests and special projects as assigned by the City Manager. The Engineering Department provides engineering services of the highest quality while protecting the infrastructure investments of the taxpayers; planning services which provide for and preserve health, safety, and welfare of the community through the application of plans, codes, and ordinances for the City’s highest and best uses of resources and development. The Engineering Department also includes the Stormwater Utility Division. To learn more about Engineering services click here. The Finance Department oversees all financial functions and activities of the City. The department comes into contact with every citizen within the city limits through the income tax and utility billing divisions; with every city employee through the payroll, treasury, purchasing, and/or accounting activities. Because of these interactions the Department maintains a low profile, sets and achieves standards of excellence, and successfully implements the functions assigned. The Finance Department also oversees the division of Information Technology for the City. The Fire Division protects persons and property from fire; provides rescue and emergency services; and fosters and promotes fire suppression practices. The administrative offices for the Fire Division are located at Fire Station #1 at 350 North Fountain Ave, Springfield, Ohio 45504. The Fire Division operates seven stations throughout the City: Fire Station #1 (350 N. Fountain Ave); Fire Station #3 (1401 Selma Road); Fire Station #4 (1565 Lagonda Ave); Fire Station #5 (1707 Commerce Road); Fire Station #6 (422 Ludlow Ave); Fire Station #7 (437 East Home Road); and Fire Station #8 (735 W Pleasant Street). To learn more about the Fire Rescue Division. The Law Department is established by City Charter and is under the direction of the Law Director, who is an appointee of the City Commission. The department represents and advises the City in all civil, criminal, and administrative law matters; prosecutes criminal cases in the Clark County Municipal Court through the Prosecutor’s office; and performs such other duties as may be required by City Charter or ordinance. 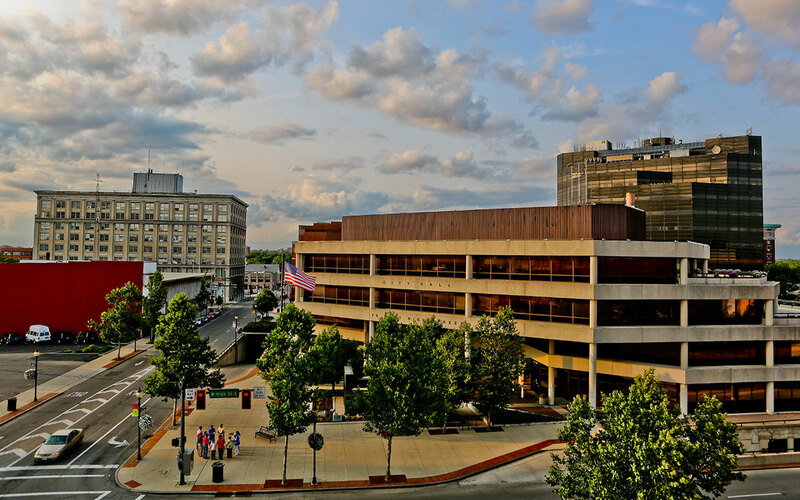 Through rendering high quality legal services, the Office of the Law Director facilitates the proper and effective conduct of the municipal affairs of our client, the City of Springfield, Ohio. The lawyers in the the City Law Department are not permitted to give legal advice to anyone other than city officials concerning city business. It is our vision to be passionate in implementing our values and to make the City Law Department a valuable asset to the Springfield community. The Law Director prepares all contracts, bonds, and other instruments on behalf of the City and endorses on each his approval of the form and correctness thereof. The Law Director gives oral or written opinions to any officer of the City, including members of the legislative authority, concerning any matter before such officer in his official capacity. If you are involved in a traffic or criminal case in the Municipal Court, you should contact the City Prosecutor’s Office, or the Clerk of Municipal Court. The Personnel Department supports the human resource needs of all City Departments and serves to recruit and develop a competent work force; manage personnel and training functions; represent the City in labor negotiations; administer City Employee health and benefits programs; coordinate ADA (Americas with Disabilities Act) functions; manage employee records. To learn about potential job opportunities with the City click here. The Police Division exists to serve all people equally with the highest degree of pride, professionalism, and personal integrity. The Division includes an Investigations Division, Uniform Patrol Division, and a Staff Services Division. The Police Division is located at the Public Safety Building at 130 North Fountain Ave, Springfield, Ohio 45502. The Division also operates a Community Center (also known as Police Substation) located at 17 West Johnny Lytle Avenue. To learn more about the Police Division click here. The Service Department consists of nine various divisions including Administration, Facilities, Fleet Maintenance, Forestry, Street Maintenance, Traffic Control, Utilities Maintenance, Wastewater Treatment, and Water Treatment. Seven are located at the Service Center at 2100 Lagonda Avenue, while the Water Treatment Plant is located at 201 Eagle City Road and the Wastewater Treatment Plant at 965 Dayton Road. The Service Department is responsible for the maintenance of all public streets, water and sewer lines, traffic control devices, right of way trees, treatment of water and wastewater, and the maintenance of all City owned buildings and vehicles.